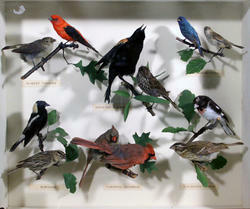 Look closely at two versions of each of six bird species, then examine gender differences and molting patterns. Deconstruct the diverse workings of six different birds’ nests, from the Killdeer’s hollow in the ground to the elaborate basket-like structure of the Oriole. Discover the different molting patterns of several Chicago area birds, and see how brightly colored birds change hues in winter. Every animal begins life as an egg, which supplies the basic needs for development, nourishment and protection. The eggs of "egg layers" differ in unique ways that ensure their survival. Examine the eggs of snakes, birds, frogs and other animals up close to learn about their differences and how the habitats in which they are laid relate to their form and care. As expert fliers of the animal world, birds can fly farther and faster than any other animal. Their bodies are designed for it. Touch a bird's wing, compare the weight of bird and mammal bones, and investigate a bird's skeletal structure to understand how most birds are built for flight. 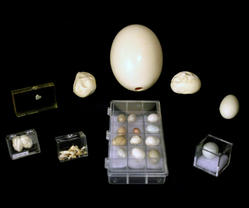 This box includes skulls and feet from the ostrich, woodpecker, duck, hawk, and a surprising bird relative. The variation in their beaks and feet remind us that they are highly adapted to different food sources and environments. Learn about the process of natural selection, test out “eating” with a variety of imitation bird “beak” types, and create an evolutionary tree of life to show how the specimens in the box are genetically related.